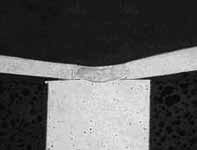 Micro-Resistance Welding | Precision Joining Technologies, Inc. The resistance welding process produces coalescence of the metals at the weld joint as a result of the heat generated by the resistance of the work to the flow of electric current. Force is applied before, during and after the application of current to prevent arcing. 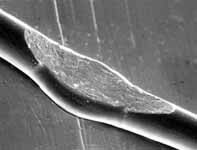 Very unique micro-resistance welding techniques have been developed for attachment of wires/foils which range in thickness from 0.0005″ to 0.030″. Very safe process. No welding arcs, low voltages. Part fit up is no longer an issue since intimate contact is established between the parts to be welded using force from welding electrode. Equipment/techniques for welding wires/foils as thin as 0.0005″. 50 watt-sec capacitor discharge power supply. 100 watt-sec capacitor discharge power supply. 250 watt-sec capacitor discharge power supply. 1000 ampere, dual pulse, DC inverter power supply. 1800 ampere, dual pulse, DC inverter power supply. Three dead weight type welding heads up to 1000 grams force. Three spring loaded type welding heads up to 10 pounds welding force.